A classic Venetian experience in the heart of the Renaissance City. La Gondola: for lovers, for families, for everyone! Whether you are looking for a romantic night out, a fun excursion with friends or family, or an engaging tour of the Renaissance City, we offer a truly memorable experience in the heart of Providence. Want to enjoy an authentic Venetian experience in the heart of Providence? Take a journey with us along the Providence and Woonasquatucket rivers and see the sights of the Renaissance City like never before. With our three gondolas, we are able to accommodate large parties efficiently. We offer large-party discounts, and trips can also customized to include historical tours, live Italian music, and more. At La Gondola, we endeavor to make your special day even more incredible. From on-board weddings to reception cruises and photo shoots, we can create a wedding day package that's perfect for you. Share the La Gondola experience with everyone you love! Look for our dock just below Cafe Nuovo's outdoor dining area. Our 2018 season has ended. We are so grateful for all of the new and long-time customers who make it possible for us to do the best job in the world. Our 2019 season will begin on or around March 31 , and run through November 9. We row 7 days and evenings a week (weather permitting) during our operating season. Please be sure to read our cancellation policy closely, especially if you are booking a trip during a WaterFire event. Owner Matthew "Marcello" Haynes has been a gondolier since the tender age of twenty, when he began rowing as a summer job while in college. Since then, gondolas and the Venetian culture have become his passions. Marcello has been "Il Boss" and principal gondolier for La Gondola Providence in Providence, Rhode Island, since 2007, and has grown the company into one of the most popular tourist attractions in Providence. 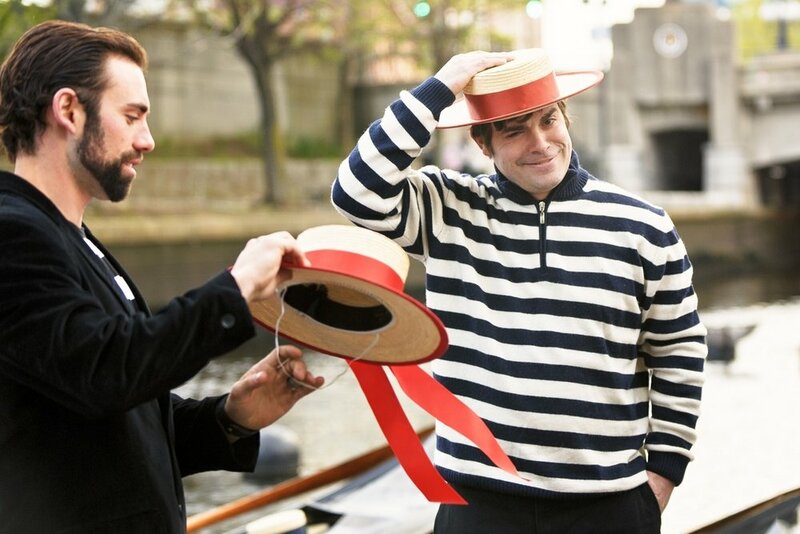 We think our gondoliers are the best this side of Venice, and we're sure you'll agree! Not only do our gondoliers (and gondolieras) have amazing skills on the water, they are also musicians, composers, physicists, engineers, teachers, lawyers, competitive athletes, and students. There's never a dull moment on the river! Click the link to meet the LGP contingent.